In part due to the huge exposure that Muybridge and his work has had this past year, new artworks continue to proliferate across the media – dance, photography, painting, music, theatre, video – on YouTube, blogs, exhibitions ….. some derivative, some innovative. I like these two pieces. The first is a collage by Carolyn Brady and appears on Flickr. (To see Carolyn’s work on Flickr, search “vintagepix”). And this ‘book’ on YouTube, by “msbrittknees” is great fun……. And I don’t know whether it’s supposed to be, but the BBC’s “The Weird World of Eadweard Muybridge” is on YouTube too. Apart from re-enactments in a 1960s US programme introduced by Ronald Reagan, Eadweard Muybridge as a character of considerable importance in the story of the creation and recording of the modern world has been absent from television. The Weird Adventures of Eadweard Muybridge is the first programme to attempt to tell the full story. It does touch on most aspects, leaving out the bits with very little visual material – the five years spent as a bookseller in New York, totally avoided in the commentary – and his various activities during the five ‘lost years’ back in Europe in the 60s. But for a one-hour programme, it packs a lot in. The talking heads include Philip Brookman, whose exhibition in Washington did so much to introduce Muybridge to a wider public; author Rebecca Solnit, in splendid hat, musing on Muybridge in San Francisco as she wanders through the harbour; print collector Michael Wilson marvelling at the artistry of the travel photographs; Jonathan Miller not getting it at all, and insisting that Muybridge was simply an entertainer; recent biographer and long-time chronophotography specialist Marta Braun talking about the Animal Locomotion sequences; art curator Ann Dumas of the Royal Academy of Arts explaining the connection with the ballet dancers of Degas; and Kingston Museum curator Peta Cook introducing the sacred scrapbook, and zoopraxiscope discs. A nice touch was Stanford Red Barn (Palo Alto) horse trainer Rachel Williamson confirming that the 1870s horse photos are still used today in the equestrian world. ‘Andy Serkis as Muybridge’ said the blurb, and he appeared reading Muybridge’s own words, wearing just a hint of period costume, but no stick-on beard. 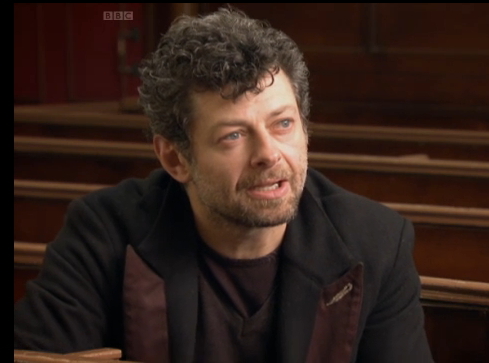 Serkis was also one of the expert talking heads, since he’s very familiar with the subject, having been developing a Muybridge feature film project for some years. And of course, he’s best known for being Gollum in the Lord of the Rings movie trilogy – his physical image altered by CG techniques, in a modern development of the motion capture and image manipulation used by Muybridge for converting his photo sequences to painted animations. No recent news on the feature movie, but perhaps it will happen someday. Coming soon to BBC1 (UK): The Weird Adventures of Eadweard Muybridge – an episode of the Imagine… series. Your dedicated blogger will possibly appear in this, fluffing and spluttering his way through answers to a question or two. My interview took place in the lecture theatre of the Royal Institution, where Muybridge lectured in the 1880s – and not improved by the seating having recently been upholstered in an unforgivable shade of cerise. Too busy to blog properly. So just a quick roundup of events over the past few days……. Monday – following some successful research that’s detailed in my previous post – to the Tate opening with Mo, and it’s full of wonderful things … of course. But I spend most of the time talking with nice people, including Philip Brookman, who was responsible for the original Washington show, and the marvellous catalogue, and Ian Warrell, Curator of 18th and 19th century British Art. Good to see a solid turnout from Kingston, Muybridge’s home town. Tuesday, I write my talk, “Eadweard Muybridge – Father of the Motion Picture?” – for the opening of Kingston Museum’s exhibition Muybridge Revolutions, which will be on the 18th of this month. Lots of pictures to find and arrange. 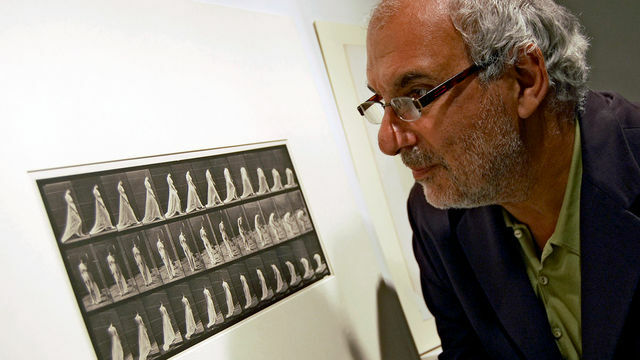 Wednesday, I’m at the Royal Institution – where our man lectured on several occasions – for a filmed interview with Alan Yentob, for a Muybridge edition of the BBC1 Imagine programme. It’s a two-shot so questions need to be answered quickly, which doesn’t allow any time for thinking, and I fluff and splutter my way through. Later, I get an email from the editor of the Magic Lantern Society Newsletter, asking if I’d write a review of the Tate show. 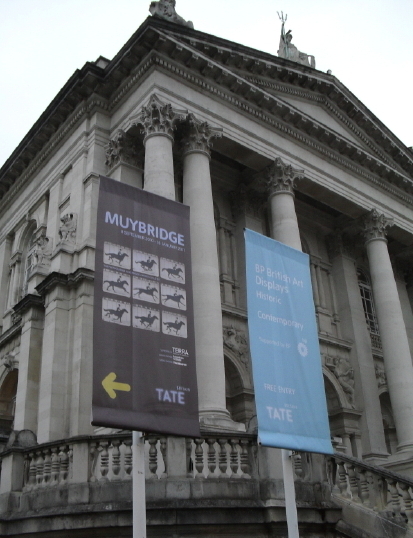 Today (Thursday), I’m trying to gather together the best reviews of the Tate show, for this blog. They’ll be listed soon. And – a friend who’s a member of the Royal Academy drops by with a copy of Poetry in Motion, an article by Simon Wilson in RA Magazine, Autumn 2010. 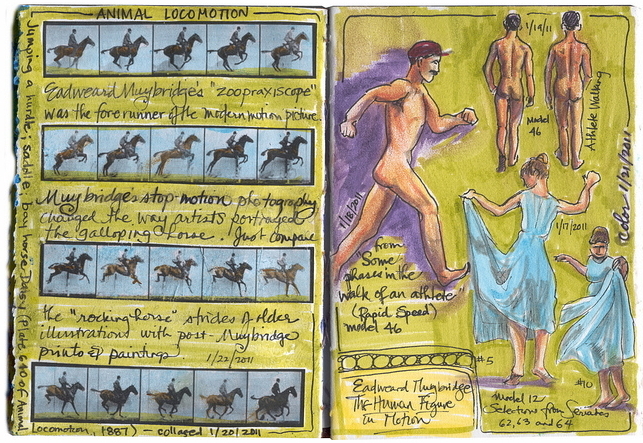 Too much Muybridge for (less than) one week, even for me! Thanks in part to a contest arranged by NPR (National Public Radio) in the USA, lots more Muybridge-related videos are appearing on YouTube. 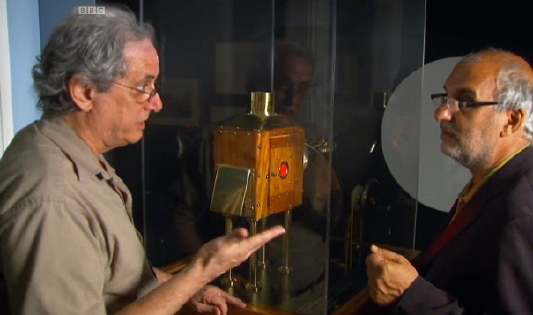 The first shown here displays a most ingenious and successful light sculpture. Muybridge Chess Set doesn’t do much, but as an idea and graphic design it’s both amusing and accomplished. A Magic Angle sculpture using a complex solid form to create shadow pictures – ingenious. 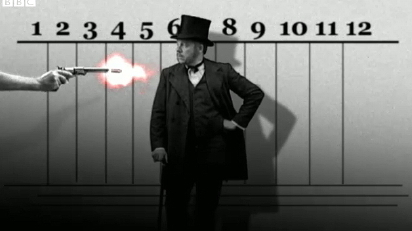 “The heart of animation still beats, from Muybridge to our present day.” A reflection on Muybridge and the nature of time, and very well crafted. Frames – Muybridge Horse Moving Through Frames. A Muybridge galloping horse completes a nostalgic still life set piece. A link from this review of Helios: Eadweard Muybridge in a Time of Change will take you to the NPR radio’s 6-minute introduction to Muybridge. 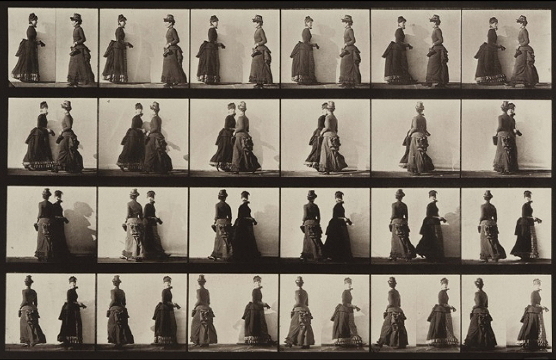 Concept: Create an Eadweard Muybridge-inspired piece. NPR will select three submissions to feature on the Picture Show blog and the Corcoran Web site. What To Submit: It may be a stop-motion animation, sequence of stills or anything else you can come up with that moves Muybridge into 2010. How to Submit: Videos should be submitted to YouTube through NPR’s YouTube Direct channel below. [there are links on NPR’s page] Make sure to tag them NPRMuybridge and include your email address in the description so we can get in touch with you. Photos should be submitted through Flickr and tagged NPRMuybridge. Include your email address in the caption. You’ll know if you’ve submitted photos correctly if they show up here. National Public Radio (NPR) is a privately and publicly funded non-profit membership media organization that serves as a national syndicator to 797 public radio stations in the United States. 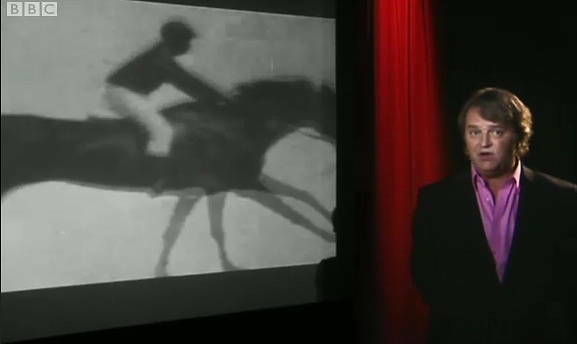 Paul Merton with one of the later Muybridge sequences, animated. (c) BBC. In 2000 I was asked to create a mutoscope installation for the National Gallery exhibition Telling Time. I converted an 1890s Edison kinetoscope film sequence of dancer Annabelle into paper prints mounted on a belt (tedious and time consuming work), and reduced the ‘mechanism’ to a bare minimum – a roller with a handle. This arrangement ran for three months or so in the exhibition, alongside collotypes from Animal Locomotion, before the picture belt was donated to Hove Museum as part of their interactive display. I was pleased to see in a scene from Paul Merton’s Weird and Wonderful World of Early Cinema, that a decade later, Annabelle is still dancing at Hove. Which is a self-centred link to the programme, but this is my blog after all. With its excellent displays Hove Museum has become a natural home for investigating such subjects. It was also pleasing to see Eric Lange and Serge Bromberg of the French company Lobster Films, so important to the preservation and distribution of early cinema, being involved in the production. The Harry Larkyns shooting. (c) BBC. I enjoyed the excellent quality of the prints, especially the tinted examples, and Paul Merton has a very genuine interest in, and enthusiasm for, silent film material – even if his attempts to convey this to non-specialist audiences here sometimes come across as just a bit patronising, to the material as well as to the new audiences. The Paul Merton shows are part of a long tradition – I grew up with comedians Bob Monkhouse and Michael Bentine presenting silent movie clips on tv – and this one will certainly make the often amazing and frequently strange (weird and wonderful indeed) material of early (pre-WW1) cinema better known to many viewers.